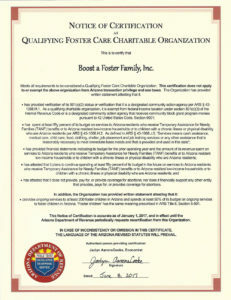 The state of Arizona offers a tax credit for donations made to Qualifying Foster Care Charities. Your donation is a dollar-for-dollar tax credit on your Arizona taxes up $1000. This is a WIN WIN for you and Boost a Foster Family. You make your donation throughout the tax year (and up to the tax filing deadline) and the funds return to you against your tax liability! If you take advantage of other AZ State credits (Public School Tax Credit, Private School Tuition credit, and the Qualifying Charitable Organization Credit), you can ALSO take the QUALIFYING FOSTER CARE CHARITABLE ORGANIZATION CREDIT. Even a person or youth with a part-time job, filing a simple form is able to redirect their taxes. The tax credit is available only to individuals and residents who file taxes in Arizona. Questions? See our FAQ's below. Providing ongoing services to at least 200 qualified individuals in the foster care system. Spending at least 50% of its budget on ongoing services to qualified individuals in the foster care system. A charity must apply for and meet all requirements of the law to be considered as a Qualifying Foster Care Charitable Organization. Approved Qualifying Foster Care Charitable Organizations’ names are listed on the Department of Revenue’s website. A “qualified individual” means a foster child as defined in section A.R.S. §8-501 or a person who is under twenty-one years of age and who is participating in a transitional independent living program as prescribed by section A.R.S. §8-521.01. How do I claim the Foster Care credit? The credit is available only to individuals. You report the name of the Qualifying Foster Care Charitable Organization you donated to as well as the dollar amount of your donation to the Department of Revenue on Form 352. You must also total your nonrefundable individual tax credits on Form 301 and include all applicable forms when you file your tax return. Donors now must reference our QFCO Code: 10043. How much can I claim for the Foster Care credit? Do I have to itemize deductions to claim the credit? Do I get a deduction or a tax credit for donations to a Qualified Foster Care Organization? You may only claim a tax credit for your charitable contribution on your Arizona state return if the organization you donated to is considered a Qualifying Charitable Organization (Boost a Foster Family is a Qualifying Foster Care Charitable Organization!). You cannot claim both a deduction and a credit for the same charitable contribution on your Arizona return. Does this tax credit apply to my Federal tax return? The Arizona Foster Care Tax Credit is only a dollar-for-dollar reduction on your Arizona State taxes. Consult with your tax professional for questions about deductions on your Federal Return. What is the period for making contributions? What if I do not owe AZ State taxes? Charitable Tax Credit dollars may be carried forward for up to five years, reducing future tax liability. I take an AZ tax credit for school donations, can I get the Foster Care Credit too? Arizona Foster Care, Working Poor, Private School and Public School. What is your QFCO Code? Donors must use this code when filing their Arizona Tax Return.